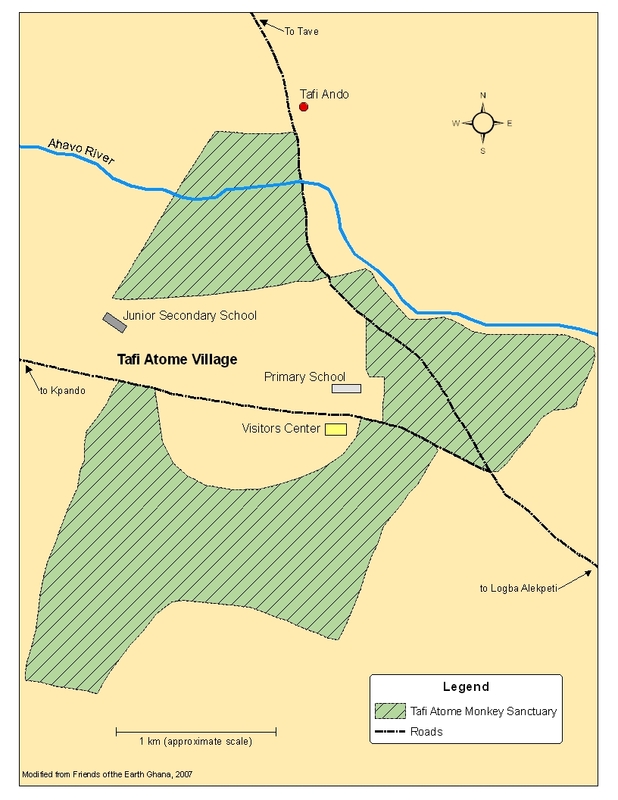 The village of Tafi Atome has over 1000 residents and is located within the Hohoe District of the Volta Region of Ghana. The language widely spoken in Tafi Atome and throughout the region is Ewe. The village is surrounded by a sacred grove of approximately 28 hectares. The grove is a dry semi-deciduous forest and lies within the forest-savannah transitional zone. Both grassland and cultivated farmland immediately surround the sacred grove. The grove most closely fits into IUCN protected area Category IV, a habitat and/or species management area. The area is protected by a 2006 Hohoe District bylaw for its main value as a habitat for its sacred monkeys. The grove supports the only protected population of true mona monkeys (Cercopithecus mona mona) in the whole of Ghana. 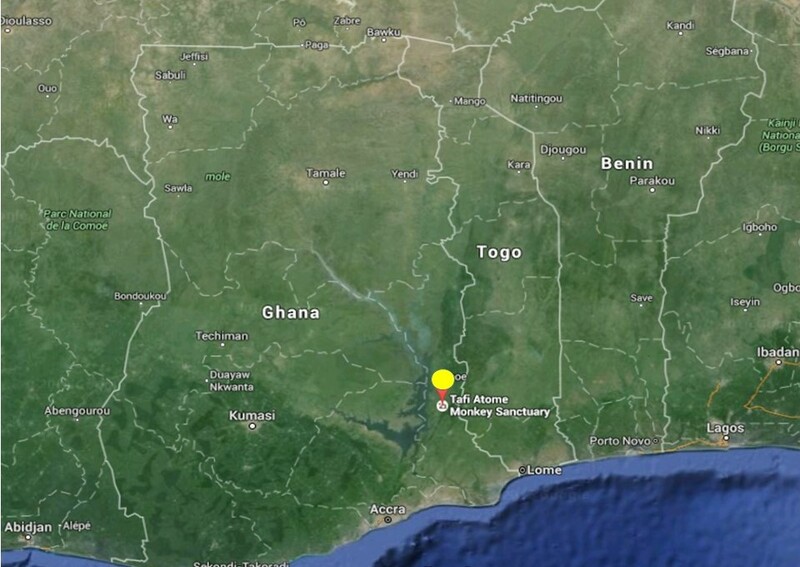 For generations, communities in Ghana have protected small forest areas for cultural reasons. Many of these forests, deemed sacred, are considered to house local gods, also called fetishes. The sacred grove at Tafi Atome Monkey Sanctuary in Ghana provides an example of how economic incentives can link with traditional protection for successful natural resource conservation. For centuries, traditional law protected this sacred forest and the natural resources it housed, including a species of sacred mona monkey (Cercopithecus mona mona) that was taboo to hunt. As newly-introduced religion began to erode traditional beliefs, the incentive to protect the forest and monkeys was weakened. It was not until the introduction of ecotourism, and the benefits that followed, that traditional protection was reaffirmed and incentives to use and destroy the forest were replaced by incentives to protect it. Tafi Atome represents the potential of community-based ecotourism to combine the objectives of community development and natural resource conservation of sacred forests. The fundametals of this project are to evaluate the water supply options available to the town. The near-by river which has traditionally been used as the water supply source is going dry more frequently thus leaving the community with few options other than walking considerable distances to obtain water. As well, with a lower water level in the river the presence cattle upstream is having an impact on the water quality. Proposed options include installing a water storage tank along with a basic water distribution system. The source of water for the storage tank needs to be evaluated but the community believes drilling a well is their best option.